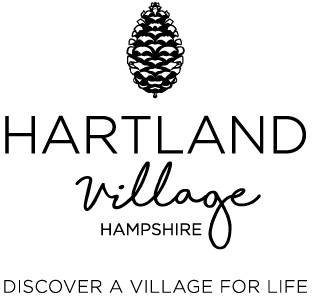 Hartland Village by St Edward near Fleet in Hampshire will be a great place to call home. This new community brings together a stunning collection of new homes intertwined with an abundance of green open space, a magnificent 70-acre country park and a new primary school. The exciting project will deliver 1,500 homes, including affordable housing, along with a village centre providing 20,000 sq ft for shops, cafés and community use. In addition, St Edward will invest in a bespoke community plan which will prioritise the creation and management of events as well as activity clubs and classes at Hartland Village to help new arrivals get involved in local life. St Edward will also support the wider community, engaging in local activities and committing its resources to help improve some of Fleet and Farnborough’s existing green spaces as well as leisure, healthcare, education and transport facilities used by people from across the area. Why Sponsor The Fleet Carnival? Fleet & District Carnival is managed by a volunteer committee made up of local business owners and event professionals with families and ties to Fleet. Their skillset will ensure that your sponsorship is used to put on a weekend of events which appeal to everyone and brings the local community together. Contrary to public belief, Carnival is NOT funded or organised by Fleet Town Council. For this reason, we are reaching out to companies to find sponsors for various elements of the Carnival. Whether that be a page in the programme, to sponsorship of an event, there is something to suit all businesses and all budgets. By sponsoring the carnival we will provide you with opportunities to promote your business/service/products and position you alongside a charity fundraising event that has been established for decades. With a reach of over 32,000 people in Fleet and 100,000 in Hart district, Carnival has a thriving and active network of supporters who you can reach out to. We are looking for companies sponsor carnival and a variety of supporting events and items in the run up to carnival weekend. We can devise a sponsorship plan to help you to achieve specific goals, such as increasing your profile or exposure in the community, launch a new product or venue. Different levels of sponsorship are available for each event, so you can choose the package and event that best suits your business. The benefits of each sponsorship package are outlined on the following pages and can be varied to suit your requirements. Fleet & District Carnival reserves the right to acknowledge the contribution of any organisation that may assist with operational, entertainment or marketing costs. All corporate sponsorship packages are issued on a 1-year or a 3-year basis. All sponsorship money received will be used to directly support the Fleet & District Carnival community events. A sponsorship agreement will only be entered into with organisations whose image supports the values and strategic objectives of Fleet & District Carnival. • Fleet & District Carnival reserves the right to cancel any of the events included in this sponsorship proposal. Under such circumstances all sponsorship agreements will be rendered void and any sponsorship money received will be refunded. 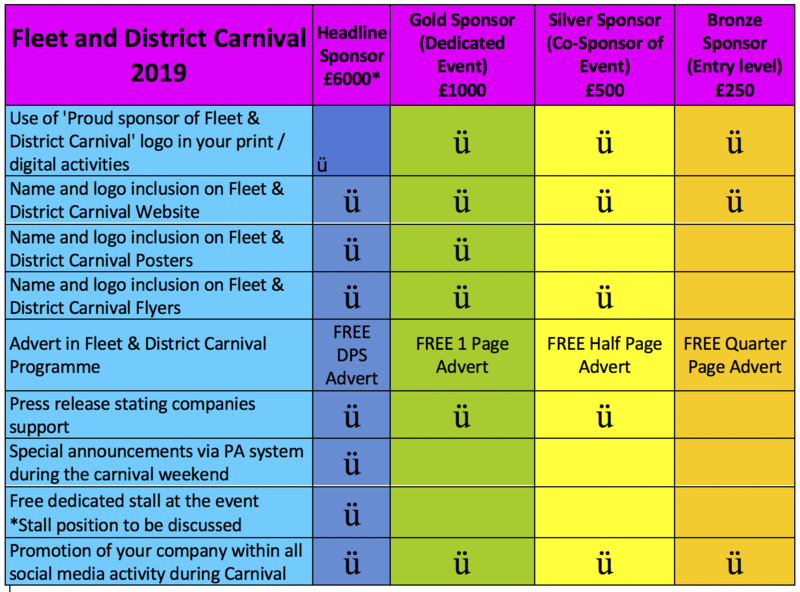 Fleet & District Carnival reserves the right to alter the sponsorship benefits contained in this sponsorship proposal. Under such circumstances all confirmed sponsors will be advised in writing. If a Platinum or Gold sponsor elects to take a promotional site at the event, the sponsor will, in addition to the terms & conditions of sponsorship, be bound by the terms & conditions applied to event market stallholders. A copy of these terms & conditions will be provided by the Events Officer. Fleet & District Carnival takes no responsibility for the erection and dismantling of sponsor promotional sites or the distribution of any promotional items at any Fleet & District Carnival event. The sponsor shall not erect any sign, stand, wall or obstruction, which in the opinion of Fleet & District Carnival event organisers, interferes with an adjoining sponsor site or other event activity. If in doubt, the sponsor should check with event organisers prior to the commencement of the event. The sponsor will not in any way damage any of the walls, floors or ceilings of internal or external venues that form part of the event. Fleet & District Carnival will request sponsor signage to be delivered to the Fleet & District Carnival administration offices at least one week prior to the event. Any signage not received by this time will not be displayed at the event. offices within one week after the event. Any signage not collected within this timeframe cannot be stored and will therefore be destroyed. Want to be part of the Fleet Carnival… There are lots of ways to get involved!